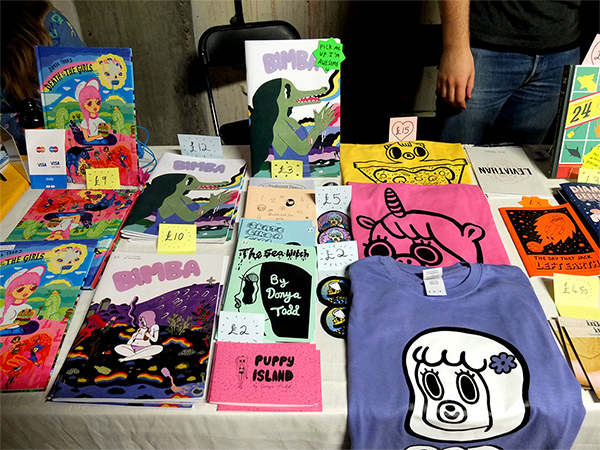 It’s been over a month since ELCAF 2015, but it feels like just yesterday that I was hovering from stall to stall, my eye holes overloading with colour, and my heart beating with excitement. 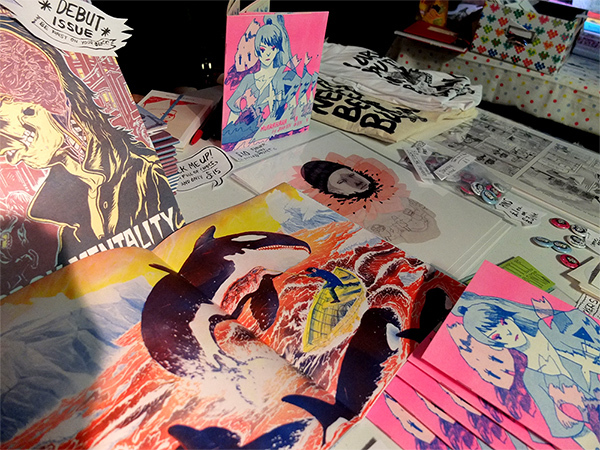 This year I attended not as an exhibitor, but as a visitor. This gave me a lot more time to look around, listen to a talk and have long conversations with some of the best people in the world. We arrived late in the afternoon (after a long drive down from Liverpool), just in time to catch the great visual storyteller Sam Bosma’s talk. 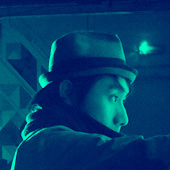 He spoke of creating intricate worlds and narratives, breaking the trends of stereotypical settings and ideas for stories and themes. 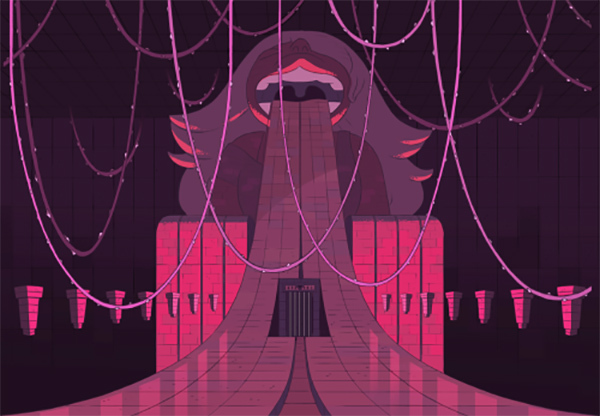 I was pleasantly surprised to discover that Sam is also one of the Steven Universe background artists (colours by the equally awesome Amanda Winterstein). 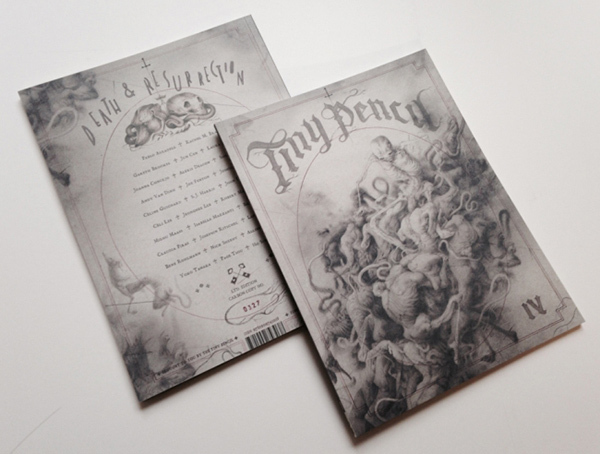 Jillian Tamaki, was the artist of choice for this years branding. 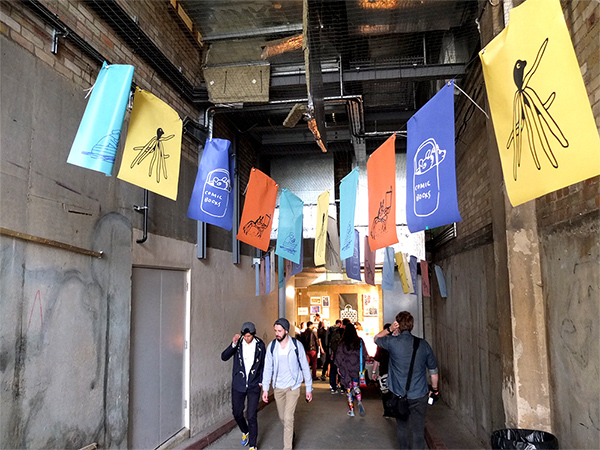 Her quirky characters filled the walls and banners across the venue, leading the way towards the main hall of this event. Familiar faces Opposite the Alley and Otto Press greeted us at the entrance, with new friendly smiles Papio Press and James Nash welcoming us to their side. A little further down, stood the wonderful Jonathan Edwards and Felt Mistress. It was great to catch up with them. Always full of knowledge, wisdom and great stories. 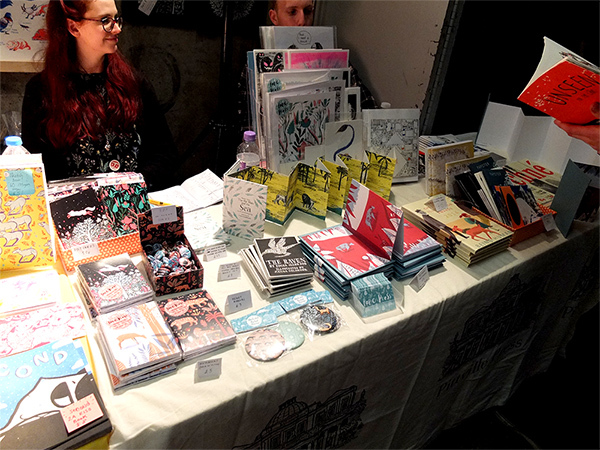 I was informed that they’ll be participating at the Lakes International Comic Art Festival in Cumbria, this year. 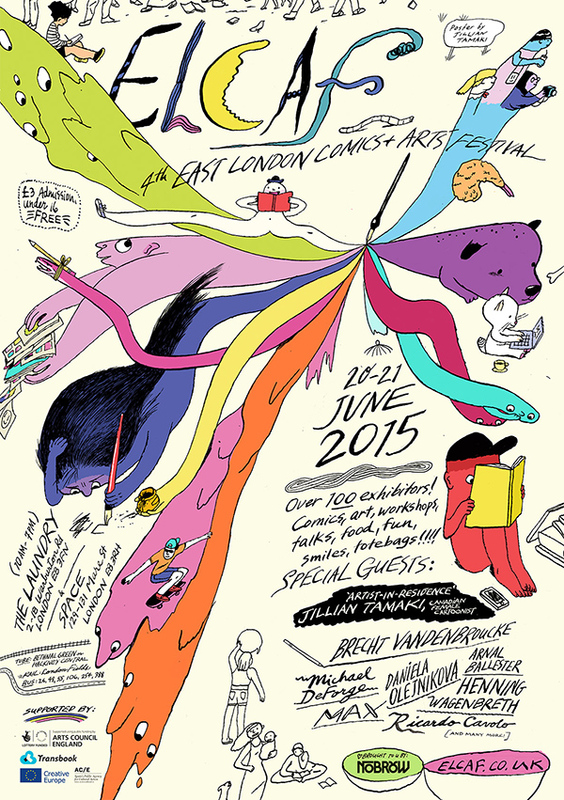 Jonathan will be on the Tank Girl panel, with artist Warwick Johnson Cadwell, and author Alan Martin. Felt Mistress will run ‘Plush Toy’ workshop on the Saturday. 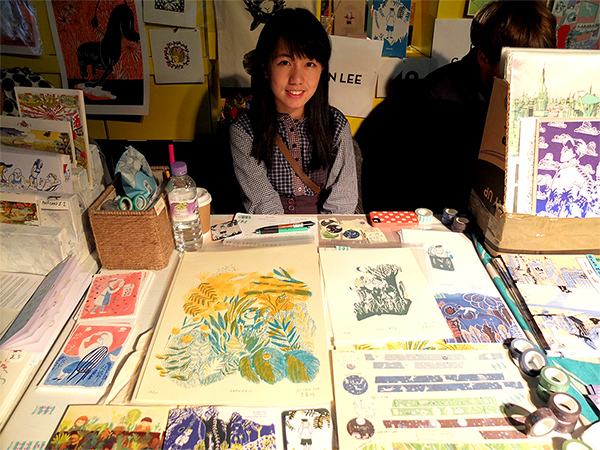 I met the lovely Amber Hsu on the neighbouring table, writer, artist and founder of the graphite powered Tiny Pencil collaborative artzine. 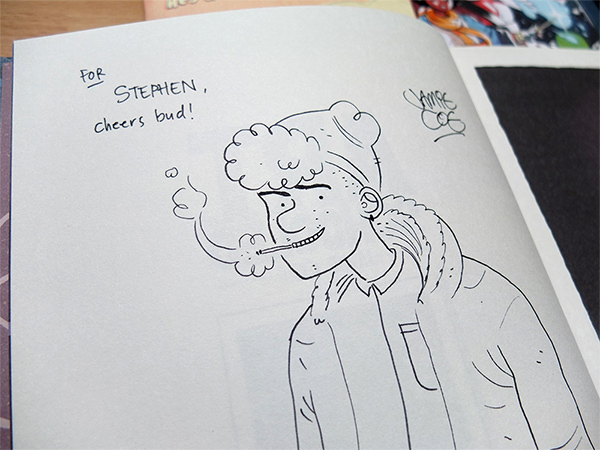 Flicking through each book, each page, each piece was a masterclass in line work, mark making and shading. 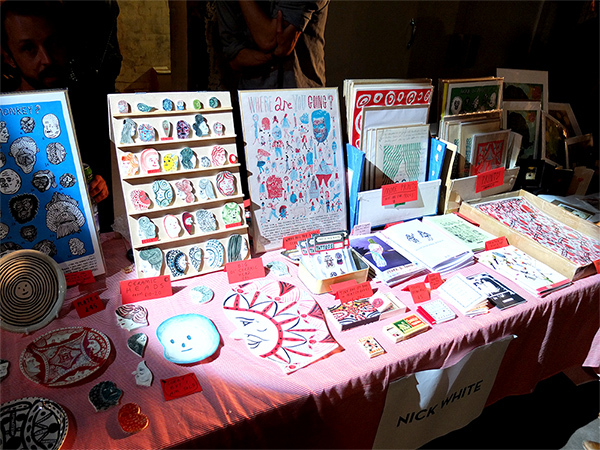 Next came Nick White, with his table of unique, handmade ceramics and prints. The wonderful selection of one-off ceramic heads stood out at this largely print based show, and make for a really special gift. 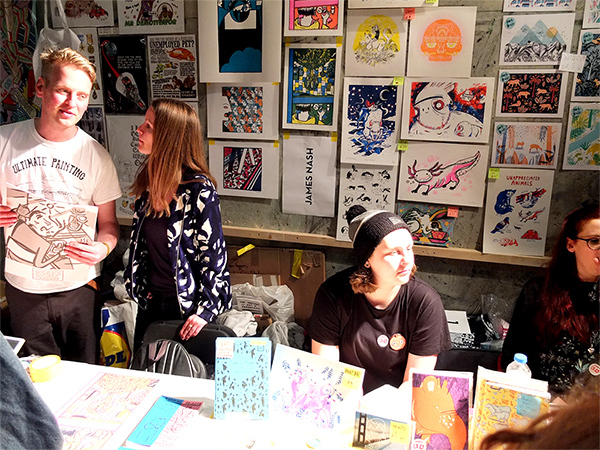 The powerhouse of contemporary illustration publishers and organisers, NoBrow, draws us into the main hall, where we met Sam Bosma again, signing his book ‘Fantasy Sports’, and Jaime Coe signing his book ‘Art Schooled’ at the main stand. ‘Fantasy Sports’ – is a great example of what Sam was explaining at his talk. A deep, fantastical world and strong characters with strong personalities. The theme and story (the title of the book pretty much speaks for itself) is the amalgamation of two things that you wouldn’t usually put together, creating a fresh, yet familiar feeling. 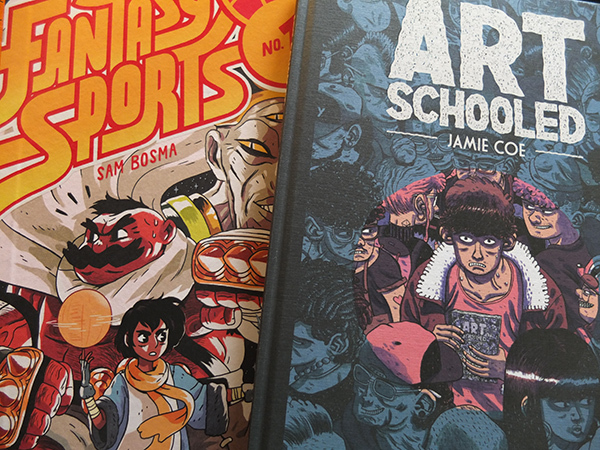 ‘Art Schooled’ – tells the story of a young man’s journey through…’Art School’. The humour drawn from real life observations is brought to life by Jaime’s attention to detail and expressive characters. Even if you didn’t go to art school, I’m sure you can still relate to the various relationships and situations. 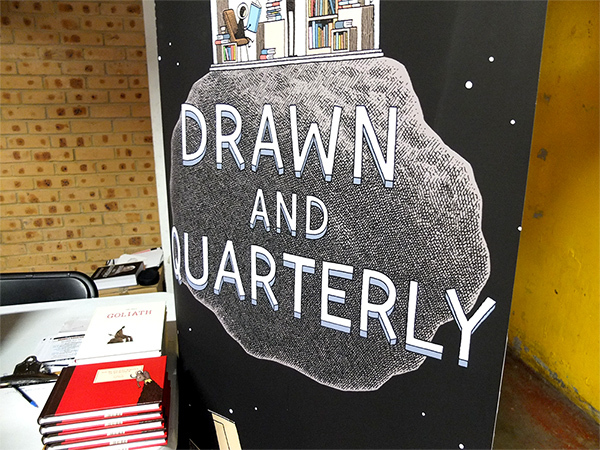 Round the corner stood the Drawn & Quarterly stand, bringing with them an array of world class illustrators for book signings, such as, Brecht Vandenbroucke / Michael Deforge / Tom Gauld / Jillian Tamaki. 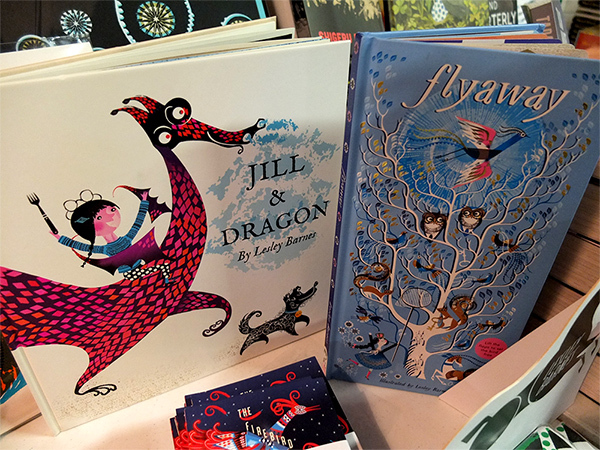 The always sweet, Lesley Barnes greeted us with an exclusive look at her brand spanking new childrens books (so new, that they’ve not even been released yet). Her strong bold shapes and colourful patterns translates very well on to this medium. 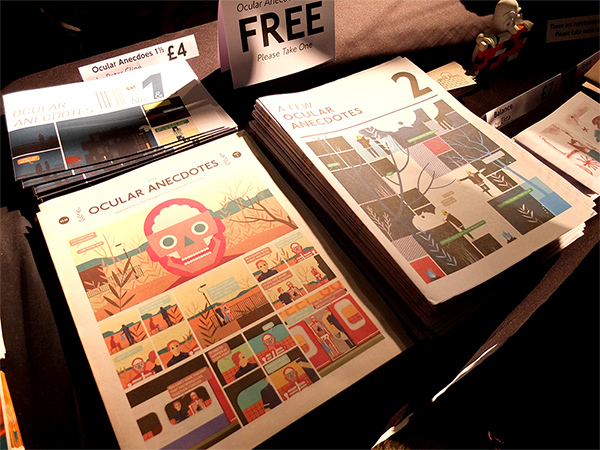 Keep an eye out for these lovely things, coming out later this year. 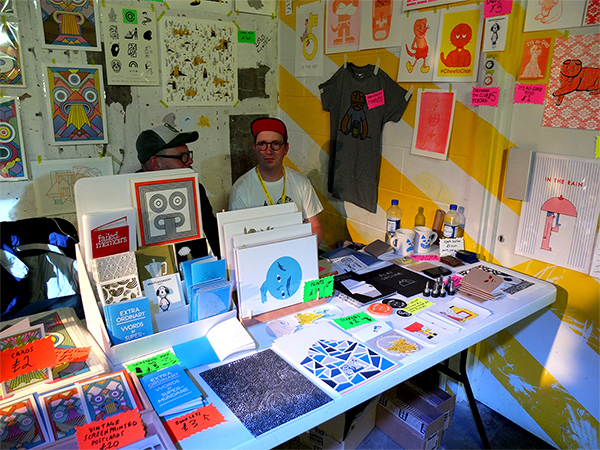 Cool kids, Jason Sturgill and Supermundane manned the Outcrowd Collective stand, bursting at the seams with amazing prints. It was great to speak to these guys, being a big fan of everyones work. Plus, the hilarious and maybe best mishearing of our name ‘Thunder Chunky’, which became ‘Wonder Jerky’. 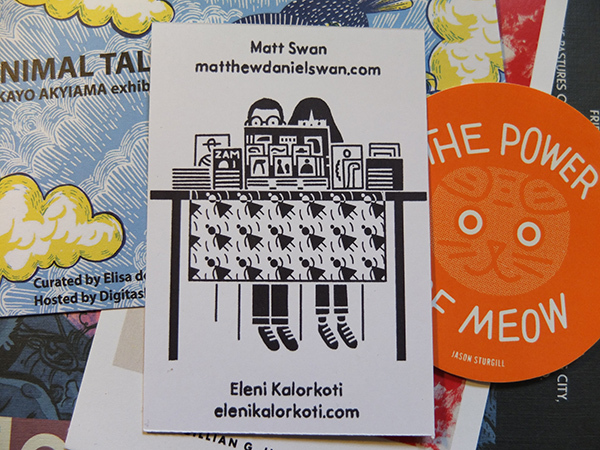 Super friendly, Eleni Kalorkoti and Matthew D Swan looked exactly like their business card. You can definitely see their personalities shine through in their work. 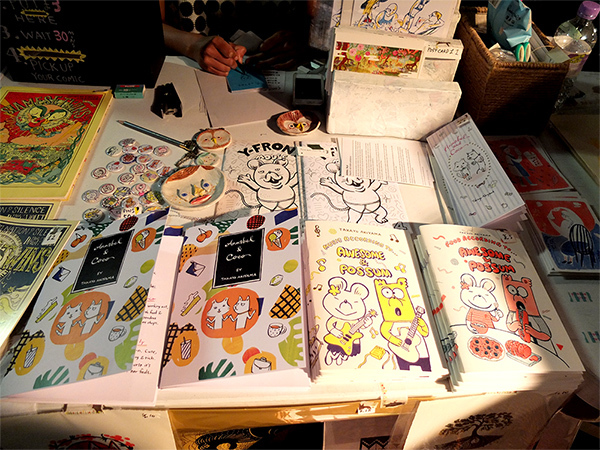 Japanese illustrator, Takayo Akyiama’s ‘Awesome & Possum’ and ‘Y-front Mouse’ comics really caught my attention with the memorable and fun characters. Her neighbour, the young graduate, Jo Shin Lee really impressed me also (I swear, illustrators are getting younger and more talented every year). To my dismay, Joe Sparrow was also here. Not that I didn’t want him to be, but if i had known that he’d be here, I would’ve taken my recently purchased copy of his ‘The Hunter’ comic to sign. Representing Canada, the charismatic Gillian Goerz, brings her Pack Mentality…book. A collection of shorts stories by several Canada based artists, some dream-like, some nightmarish, but always stunning and intriguing. Italian publication, Lucha Libre brought some amazing things with them. 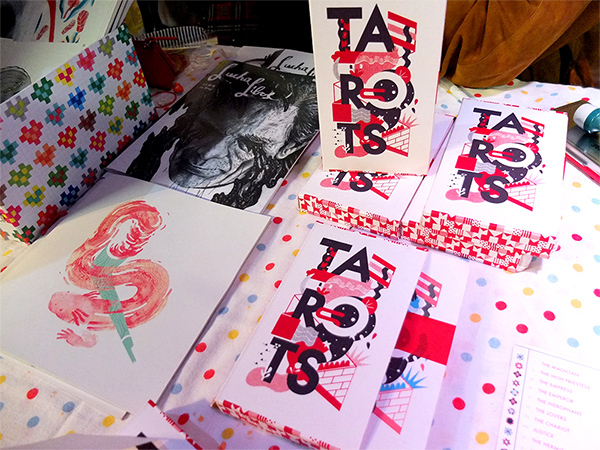 A full collection of intricately illustrated Tarot cards with a slick typographic packaging. A welcome change to the increasingly popular playing card illustrated packs. 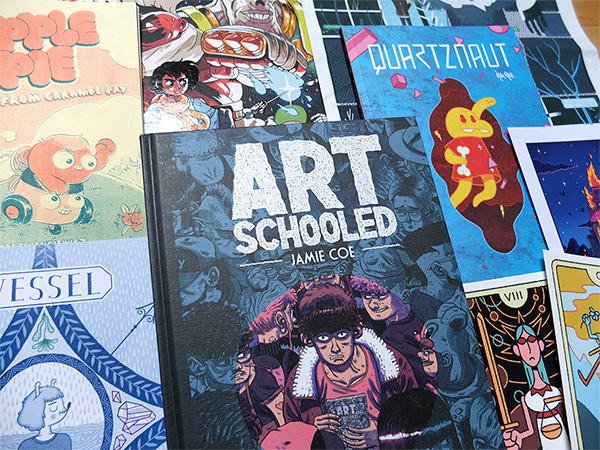 And the award for the ‘best new discovery’ goes to…Spanish publishers, De Havilland, for their comic ‘Quartznaut’ by Alex Red. 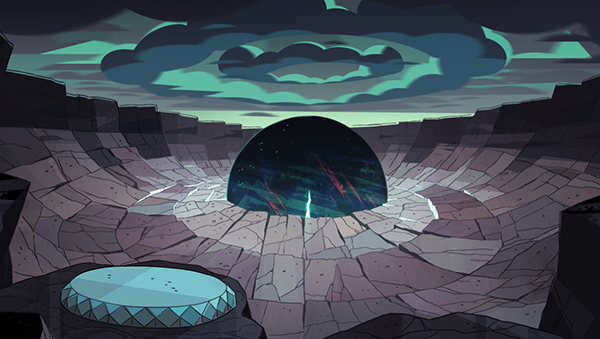 ‘Quartznaut’- is four interconnected stories, linked through time, space and dimensions. 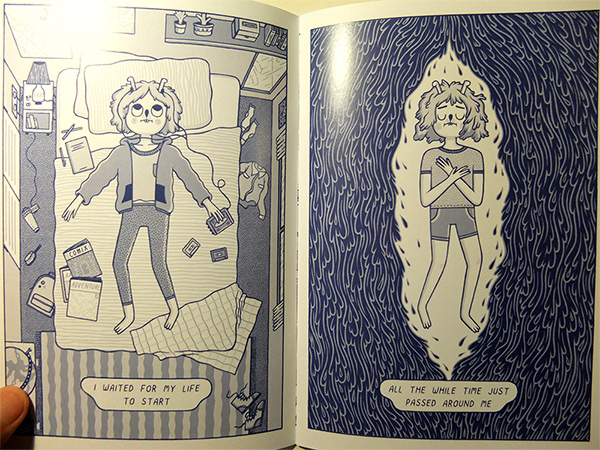 Alex cleverly separates the worlds and pacing of the story using different colour schemes and moods. We’ve now reached the back of the hall where last years ‘best new discovery’, Benjamin Wright and Isaac Lenkiewicz resided (leaving the best till last I assume). They’re back under the quirky new name of La la la pom pom. 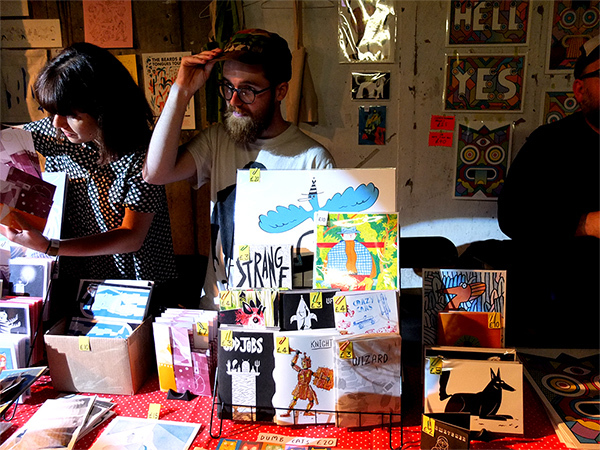 These guys are the epitome of comic and zines, what these festivals are all about. 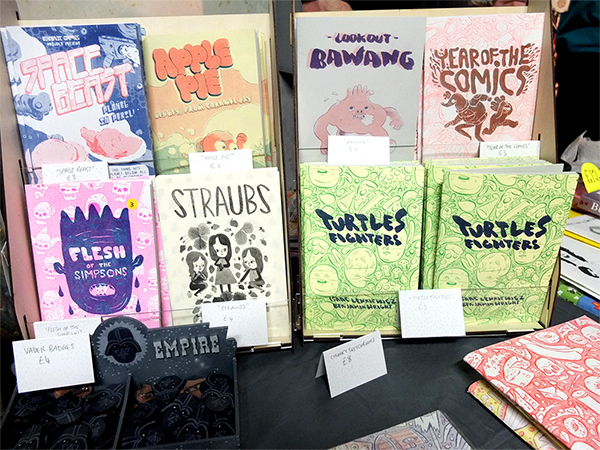 I was extremely excited about the news of a ‘Turtle Fighters 2’ zine (which was one of last years favourites). 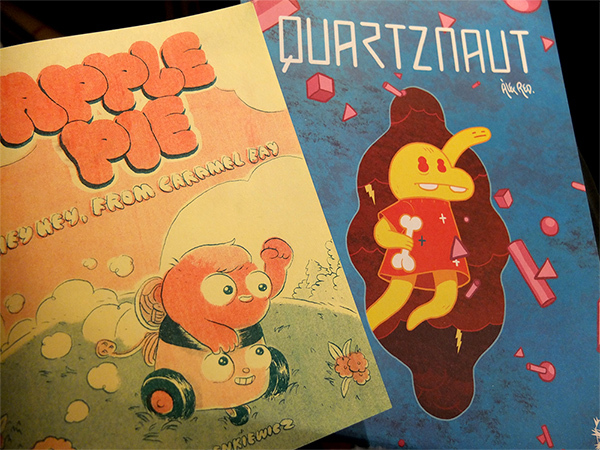 I quickly picked up a copy of Isaac’s ‘Apple Pie’ – the wacky story of a young little dude who takes on seemingly mundane jobs, which end up becoming something much more. It’s the kind of story which leaves you wishing for more. 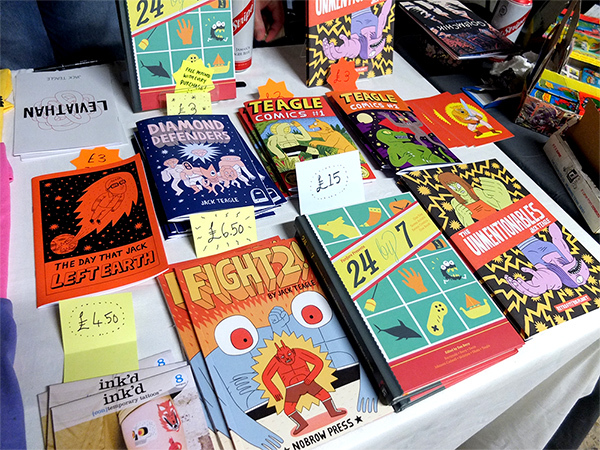 Veterans of the comics and zines world, Jack Teagle and Donya Todd, need no introduction (even though they just got one). 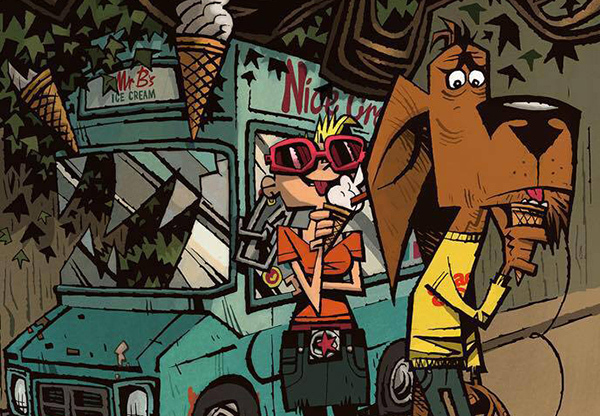 They’re back with their ever increasing body of work, from the popular Jesus Vs Devil classic ‘Fight’ zine, to Donya’s iconic Bimba and Chubby characters. I thought I was at the end of the show, but, out of nowhere, a secret doorway appeared. This doorway led to another room filled with artists, but my time was nearly up. 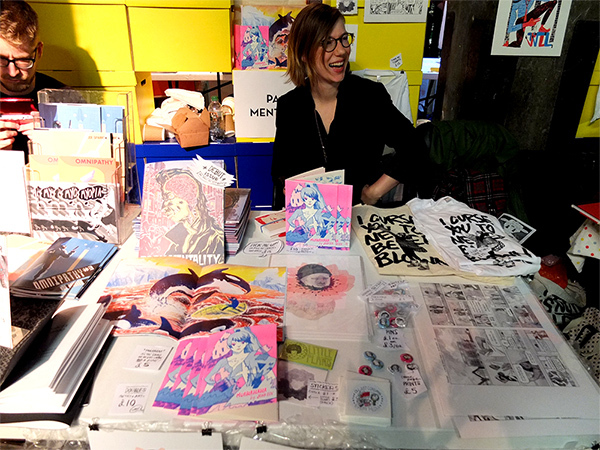 Then suddenly, in the corner of my eye, my creative ‘sixth sense’ picked up on my favourite Kristyna Baczynski. 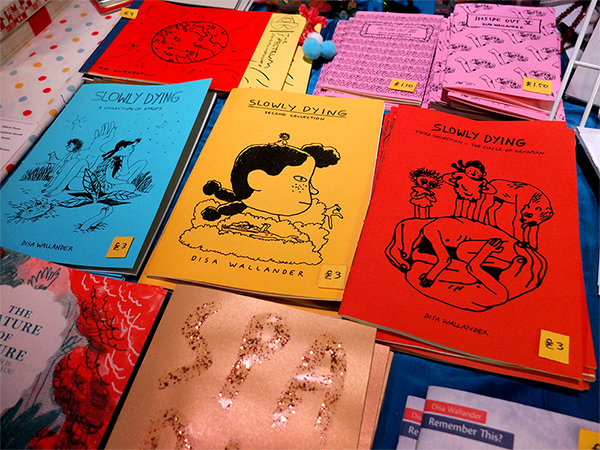 Luckily, comedy hasn’t slowed her zine production down, with new zines ‘The Golden Horseshoe’ & ‘Vessel’. 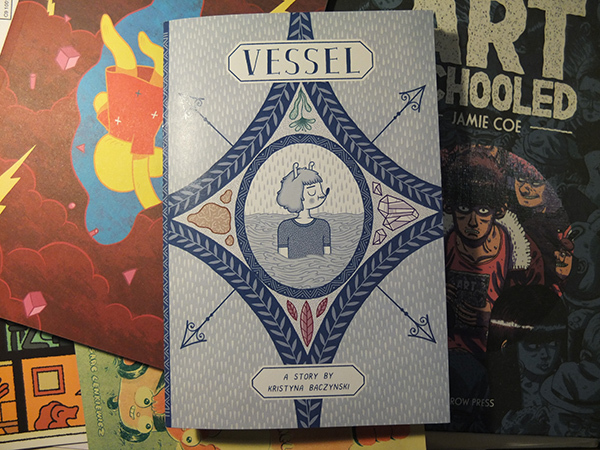 Not that I’m biassed, but ‘Vessel’ is one of the best things I’ve ever laid my eyes on. It’s story telling at it’s best. It’s like visual poetry; short, concise and full of deep meaning. The kind of thing that makes you stop and think, “I waited for my life to start. All the while time just passed around me.” – her words and the compositions are simple, but powerful.